This is the nominee that I was rooting for that didn't make the short list (there's always one, of course*). The first man to ride around the world on a bicycle. 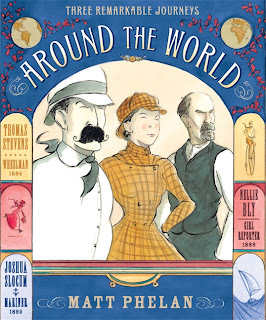 A girl reporter determined to beat Phileas Fogg's record. An old sailor who circumnavigated the globe alone. Excerpts from the travelers' journals (and other publications that tracked them) mingle with imagined conversations and beautiful watercolor art. The stories are inspiring and uplifting -- it's beautiful to watch these people find and achieve their dreams. Themes of persistence and innovation are conveyed without any saccharine undertones. Several times while reading I said "wow" out loud. "Can you believe this?" is what I thought, but the stories are completely credible and obviously thoroughly researched. I found it fascinating to learn what humans are capable of, in re: world travel. I think this would make excellent bedtime story material for younger kids, and teens and adults will pick up on the more subtle themes in the book. It's worth mentioning that Phelan's art is amazingly simple and skillful. I'm thinking in particular of the facial expressions of Nellie Bly, girl reporter. How Phelan conveys such emotion with just a few lines is beyond me. Find it, read it. You won't regret it. An excellent choice for those who haven't read many graphic novels. *in 2010, that was Turtle in Paradise; in 2009, Cat Burglar Black; in 2008, My Dad's a Birdman. Bonus: I picked this book for my book club! Reactions are here. Another update: I now have affiliate links for this book! If you make a purchase I will receive a small commission at no extra cost to you. 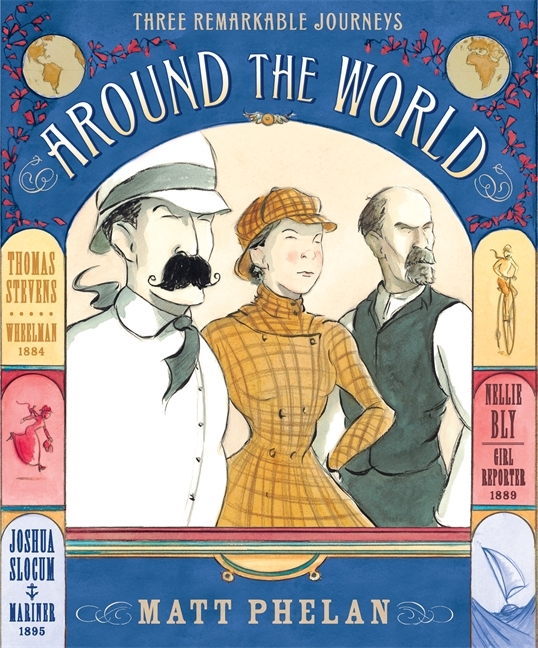 Around the World from B&N; Around the World from Amazon. Sounds lovely. Though I doubt our tiny city library carries it. :( Still, I'll have to check.